Alpe d’Huez, Mont Ventoux, the Muur van Geraardsbergen… the Kogashi Forest. 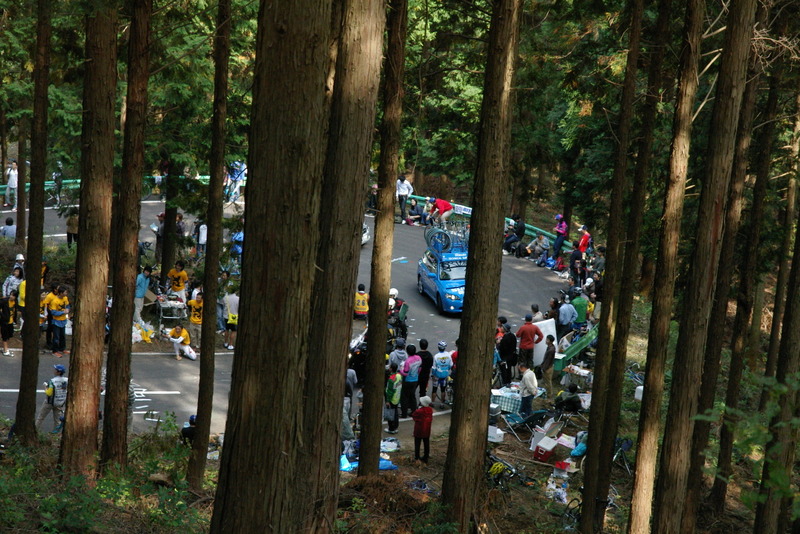 You probably know the first three so here’s a closer look at a mountain road that’s packed with passionate fans when the Japan Cup comes along. The Route: Kogashiyama, “Kogashi mountain” is west of the city of Utsunomiya in the Tochigi Prefecture, Japan. The climb begins on Shinrinkoen Dori, passes the Akagawa dam and where it enters the park and forest on the flanks of the Kogashi mountain. It is 4.9km long at an average of 4.9% with a mix of 8-9% slopes and flat sections. The Feel: as climbs go this isn’t a monster but starts soft before turning Alpine. It begins with a definite inflection point where the tarmac ramps up prompting an immediate gear change. The road passes farmland with the woodland slowly getting denser as road climbs up. It’s ordinary for now and only after two kilometres does the park begin, there’s a car park beside the road and soon the large river dam appears. It flattens here, take the left fork past the lake to pedal past picnic areas. It’s all so calm and gentle. There’s little traffic and what vehicles there are can be alarmingly quiet. High ownership of electric cars may be something to cheer about but it means a vehicle approaching from behind can be hard to notice until it glides past. It’s not necessarily dangerous, more a cultural adjustment to tune the ears to the sound of the tires. Suddenly the road rears up and becomes decidedly Alpine and there’s a kilometre of 9%. The billiard table smooth surface helps but only so much, it’s slow going. It’s still a moment to enjoy, the road is engineered but feels part of the forest, the tall pines stand close to the road and it’s dark even on a bright day. After a steep S-bend the road keeps rising and then if you lift your gaze up you’ll see a winding ribbon of tarmac, as if a section of the Montvernier hairpins had been imported. The top of the climb comes with the road cut into the hillside and immediately plunges into a fast descent with a smooth and grippy surface. The Race: the Japan Cup has made this climb famous. The world championships took place on this circuit in 1990 and the Japan Cup road race started in 1992. Ever since the event has grown and attracts large, passionate crowds. Having suggested a similarity to Alpe d’Huez or Mont Ventoux at the top the closest likeness is probably the the Alto de Arrate above Eibar in the Basque Country as it’s full of knowledgeable, enthusiastic fans who have made their way to see the race as opposed to hundreds of thousands of holidaymakers hoping for a show and don’t care that much for the sport of cycling. In the Kogashi forest it’s applause and cheers here rather than selfie-sticks and jeers. The Japan Cup atttracts several World Tour teams. Their presence telling, those with prominent manufacturers are there with Cannondale-Drapac, Trek-Segafredo, BMC Racing and Lampre-Merida are there and if title sponsors Sky or Orica-BikeExchange have no interest in the Japanese market, their bike sponsors Pinarello and Scott surely do. The fans are legion and many have high-end bikes and here is a good way for the bike companies to connect with customers. Ride more: you can lap the same 10km circuit as the Japan Cup road race but there’s plenty more to explore. Japan has coastal plans and a spine of mountains running along its length. Head west or north from here for more climbing with woodland, river gorges, terraced rice fields and traditional architecture. All the roads are smooth, drivers courteous and there are regular places to buy food and out of hours the silent army of vending machines supply hot and cold drinks. Return to the city of Utsunomiya to refuel with gyoza, these Japanese dumplings are the local speciality. Travel and access: Utsunomiya sits on the highspeed Shinkansen line north of Tokyo and is less than an hour’s ride from the capital. Bikes are accepted on the trains but under conditions, the bike needs to be wrapped in a light pouch rather than a bulky case. The Tohoku Expressway offers fast access from Tokyo too. It’s roughly a 20-30 minute ride from the city to the Kogashi forest. Wonder why this wasn’t a new WorldTour event. It’s in Asia, so ‘globalisation’, and it has fans. I imagine because the organisers, unlike their Chinese counterparts, weren’t offering to throw fistfuls of cash at the UCI. +1 The UCI formula for WT level events seems to be little more than “Start with nothing and just add cash. Lots of it!” I’d hoped Cookson and Co. could repair the damage done by “Mr. Mars” and his sidekick, “The Mad Hatter” but I’m starting to agree with those suggesting pro cycling needs an entirely new sanctioning body. The devil is of course the WHO and the HOW. Exactly, Cookson may have been a refreshing change from McQuaid, but many of the same faces are on the Boards and staffs within the UCI… therefore Cookson’s effect is limited. Why assume that Cookson is actually trying? It’s never his fault. Why? I didn’t assume anything. I’m only saying that if you really want change at UCI, you can’t just replace the figurehead. The role of President is purely a PR position if the organisation continues to operate as it did under McQuaid. Yes, and as well as all the other points others have made below, presumably Japan wouldn’t have the clenbuterol-contaminated meat issue that comes with racing in China. I guess it’s because they want to see local riders compete also, something they can’t achieve under WT status at the moment. Great to see some Japan coverage on InnerRing – the cycling fans there are indeed really enthusiastic and knowledgeable. Having spent some time cycling in various parts of Japan (pleasure riding rather than racing though) I can recommend it as a great place for a touring trip. The car drivers are generally courteous to cyclists, the road surfaces are very good, and there several long-distance signed routes that can be followed. The scenery is often stunning and the food is amazing as well. Thanks for the link to the TV series, people should find that useful. Just read yesterday’s post from Steve Potts commenting on riding a bike in Hong Kong, and compare to Inrng’s description above of courteous car drivers in Japan, and you can get a sense of the fundamental difference between the Chinese and the Japanese. But aside from such cultural stereotyping, more relevantly to our discussion of the UCI’s purpose and ambitions, which might be conflicted at times, we should ask why there is no World Tour pro race sanctioned by the UCI in Japan, a blatantly cycle racing obsessed nation–with a wildly popular comic book and cartoon series themed entirely on road racing–while China, where nearly everyone is wholly indifferent to cyclists on the road despite there being so many, let alone anyone being enthusiastic about people racing on bicycles as a sport to make a living–gets three UCI sanctioned races. There’s no rhyme or reason behind it, just the bags of money passing from Chinese hands to the UCI. What is it with sports governing bodies, in general, such as FIFA and the IOC, and now the UCI, and their appointed managing officers–who treat their tenure as an opportunity for a once-in-a-lifetime money grab. What’s truly pathetic is that these officers entrusted with the care and well-maintenance of the sport are so blinded by their own greed and arrogance, they cannot see that what they are doing is so glaringly obvious in the eyes of everyone that is an afficianado of the sport. As Commissioner Jim Gordon said, “He [Batman] might not be the hero that Gotham deserves, but he’s the hero that it needs.” When will pro cycling get its hero, regardless of whether it deserves one, or not? +1 Where is the benevolent dictator the sport needs now? Is there someone who can avoid the results of “power corrupts, absolute power…..? Let the UCI be sort of like the NCAA in the USA, but the pros might need to say arrivederci to the Olympic Games so they can get out from under the UCI’s bungling and confused regime. I don’t want them to become like the NFL, NBA, F1 or fall totally under the hegemony of ASO, but there’s got to be a better way…and it’s not VELON. The rulers have gotten to the, hit Me once shame on You, hit Me twice shame on Me point. Money doping. Anyway, appreciate the read about a ride and racing in Japan. I love learning. It may be that the Japan Cup doesn’t want world tour status. They might rather have their local teams mix with the 6 or so WT teams that show. Otherwise they only have a few Japanase WT pros to root for. It’s some of the issue with Us races going WT, you lose the local conti teams. I don’t see how Japan additionally values human rights when up to this date they still refuse to admit and apologize for what they did during World War Two. That includes forcing innocent women to work in brothels and killing and torturing millions of civilians in the name of scientific research. If we punish countries for what they did in the past – as opposed to what they’re doing now – we’ll have no races anywhere. Or anything else. For that matter; if We punish countries for what they are doing right now, -We’ll have no races almost anywhere. Guys – races choose if they want to apply for World Tour status. Japan Cup didn’t apply, Tour of Colorado didn’t apply, etc. So it isn’t up to the UCI to grant WT status unless the race wants to pay for it. That’s the system that we have (I’m not saying it is good). So, for example, the Tour of Colorado didn’t want to pay for WT status… which would have put them in even larger financial trouble because WT status is way more expensive. And, for a race like Tour of Colorado, the extra exposure of WT status really isn’t that significant. I can’t see how it would’ve led to better sponsors. C’mon Larry – at least athletes get paid by NFL, NBA, etc. The NCAA “lets” (makes) them work for free. The question I have is: What does the Talent want? Good point Bern, NCAA might not have been the best example to use, but I meant that UCI might continue to oversee cycling below the professional (well, at least paid ABOVE the table) level while the pros (as in NFL, etc.) could have their own league, rules and sanctioning body. Larry – I see what you mean, you mean let the UCI only oversee the amateur arms of cycling. Then, the professional teams and events work under their own organisation. This would make sense in theory. The only issue is that I can’t see any consensus in the near future between the organisers, teams and riders. ASO would be the most likely candidate to run this type of scenario, but they’re on a divide and conquer purge at the moment and show zero likelihood to acknowledge rights or bargaining power of the riders and teams at any time in the foreseeable future. Thanks inrng. Wants me to go to Japan and ride my bike. It’s recommended, smooth roads, coastlines, mountains and more. Plenty of good food too for before/during/after. I live and work in Japan, first in Tokyo and now in Niigata. I also raced as a junior back in the US. If you look for it, there are tons of great routes in the countryside. Agriculture is still a big industry here and the side-effect is that there are tons of useable farm-roads. And there are lots of great climbs, since a large Japan is essentially mountainous. Not just farm roads but often very smooth tarmac. I recently went on a cycling holiday through Japan, didn’t stop at Utsonomiya however. But if you change trains at Utsonomiya and head to Nikko (probably an extra 30-45mins) there is some amazing riding. The ‘Romantic Highway” in particular, 46 hairpins, one for each Kanji (character in the alphabet). The people are extremely accommodating too – didn’t have one issue on the roads in 3 weeks..
Nikko is a great suggestion for anyone trying Kogashi and wanting to ride more, plenty of hills, valleys and scenery. Nice to see some Japan stuff Inrng, thank you. I’ve been living and riding around here for a while now and started making YouTube videos this year. Fairly amateur production but I’ve had some good opportunities come my way. I made a video as me and my friends climbed Norikura, Japan’s highest peak, twice: https://www.youtube.com/watch?v=1pLTmqS3VP8&t=431s. Shameless plug but if anyone’s headed to Japan they might enjoy it. Lots of other content from Japan too in the vlog style on my channel.